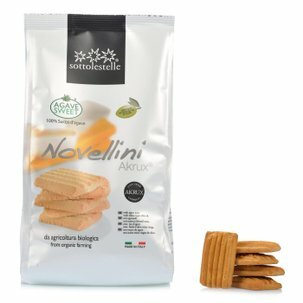 Sottolestelle red fruit shortbread biscuits are made from Senatore Cappelli durum wheat. Akrux is an original wheat cultivar that has never been genetically selected or cross bred. Made exclusively with the finest quality ingredients such as Akrux durum wheat flour, extra virgin olive oil and red fruits of certified organic production, these shortbread biscuits contain no egg or milk so they're ideal for people with related tolerance issues. Enjoy them for breakfast or any time of the day when you need break and a pick-me-up. 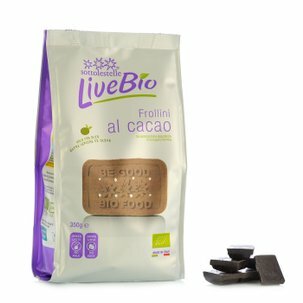 Perfect if you have low egg or lactose tolerance or if you're looking for a light and healthy biscuit that tastes absolutely fantastic. Ingredients Cappelli Akrux durum wheat flour 60%, extra virgin olive oil 14%, cane sugar, red bilberries 3%, corn starch, rice syrup, wild berry compote 2% (glucose-fructose syrup from corn, strawberries 9%, raspberries 9%, bilberries 9%, gelling agent: pectin, corn For more information on product labels, please contact our Customer Service department. The information on the labels of the products may vary for reasons beyond our control, therefore, there may be discrepancies between the information on the site and that on the products delivered. Please always check the information on the product before consumption or use.